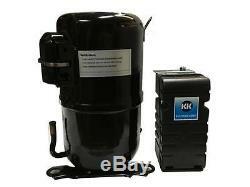 Kulthorn KM2510Z-2 Compressor 2-1/2 HP Low Temp, R404A, 220V, 1 Phase. Comes complete with starting kit. Capacity 2,946 / - Watts. 10,052 / - BTU/Hr. 2,533 / - Kcal/Hr. Power Input 2,806 / - Watts. Locked Rotor Amps 90.00 / - Amps. Max Continuous Current 21.20 / - Amps. Rated Load Amps 13.10 / - Amps. COP 1.05 / - Watts / Watts. EER 3.58 / - BTU/W-Hr. Condensing Temperature 120.0 °F. Evaporating Temperature -10.0 / - °F. Liquid Temperature 120.0 °F. Return Gas Temperature 40.0 °F. Ambient Temperature 95.0 °F. Refrigerant Flow Control Capillary Tube. Oil Charge 1,142 cc. 2 Pole 3,500 / - r/m. Voltage Range 198-253/- Volts 60/- Hz. Open / Close 130-140 / 78-60 ° C.
1st Cycle trip at 25 ° C 87.0 Amps(main) 42.0 Amps(start). Model Number KGE 681-9 (RVA4AM6D). Start Capacitor (CSR Only) 216-259 µF 250 VAC. Disch Resistor for Start Cap 15000 Ohms 2 w. Run Capacitor 45 µF 450 VAC. At ADVANCED REFRIGERATION PARTS INC. Our products are manufactured by Leader Refrigeration Manufacturing Inc. A trusted company with over 20 years of commercial refrigeration experience. In addition, we carry top brand products for your custom needs. We offer these high quality products at a reasonable price to bring you both dependability and affordability. Has the amount of experience and knowledge of commercial refrigeration you can trust; we help you find the solution to your needs. Our showroom is located at: ADVANCED REFRIGERATION PARTS INC. We warrantee and represent that the goods are as described in the above listing. We specifically disclaim any implied warranties of title, merchantability, fitness for a particular purpose and non-infringement. Customers should satisfy themselves that any item choice made is suitable for their intended purpose or use. We pride ourselves on our customer service. Terms & Policies to You may be posted on our Web site and will be deemed delivered within thirty (30) days after posting. ¢All content appearing on this Web site is the property of: AdvanceD Refrigeration Parts INC.
¢All brand, product, service, and process names appearing on this Web site are trademarks of their respective holders. Reference to or use of a product, service, or process does not imply recommendation, approval, affiliation, or sponsorship of that product, service, or process by AdvanceD Refrigeration Parts INC. Information on this site may contain technical inaccuracies or typographical errors. Information, including product pricing and availability, may be changed or updated without notice. AdvanceD Refrigeration Parts INC and its subsidiaries reserve the right to refuse service, terminate accounts, and/or cancel orders in its discretion, including, without limitation, if AdvanceD Refrigeration Parts INC believes that customer conduct violates applicable law or is harmful to the interests of AdvanceD Refrigeration Parts INC and its subsidiaries. The item "Kulthorn KM2510Z-2 Low Temp Compressor 2-1/2 HP, R404A, 220V ONE YEAR WARRANTY" is in sale since Saturday, June 18, 2016. This item is in the category "Business & Industrial\HVAC\HVAC Parts\HVAC Refrigeration Compressors". The seller is "adhvacprts" and is located in Brooklyn, New York. This item can be shipped to United States.